In a recent post I mentioned oil painting with washes of liquid paint as opposed to solid paint. The above painting was painted with washes of colour – loads of solvent and very little media. Its more like drawing with ink than traditional oil painting. The cons: Colour is flat. The richness associated with oil paint is not there. The brush strokes are ‘blobs’ and not textured strokes. The picture is drawn with paint, which means your drawing ability must be ‘spot on’. The pros: Fast painting. The application of the paint is in swift flooding strokes. The technique allows dark and light colours to be applied at all stages of the painting. Normally the shadows are painted first in transparent darks and the mid tones and highlights applied later. This is very much applied in Still Life. I have a time lapse video of the above painting which I will post soon. 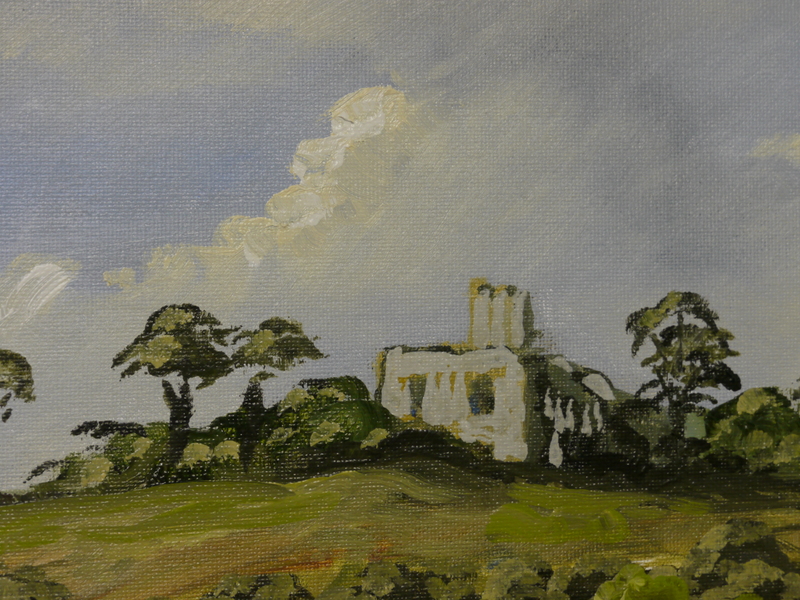 I am currently painting an oil painting which includes the above building, or what remains of the above building. The last 36 years has not been kind and very little now remains. The above sketch is a ‘Scraperboard’. This panel starts as black layer of dry Indian Ink on a white chalky layer. The picture is created by scraping off the black with a sharp point. 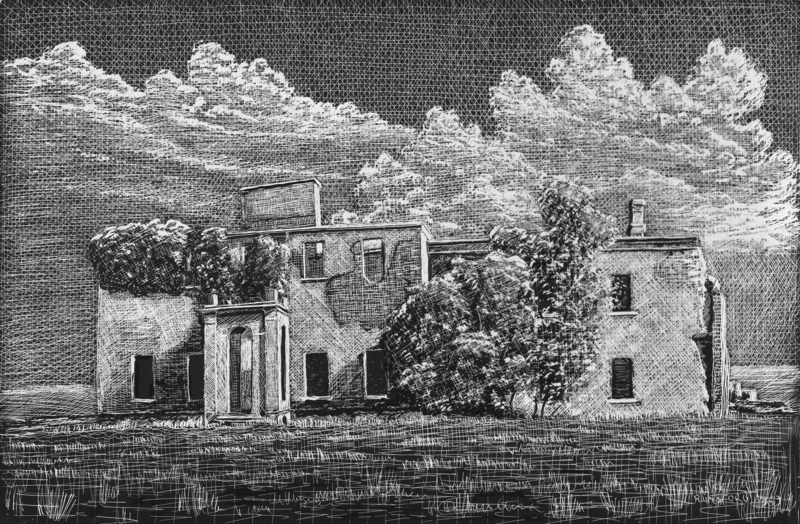 The shades of grey and different textures are produced by a series of fine lines. Its a tedious and time consuming process and because you are working in reverse, black to white, it makes it all the more difficult. Why use ‘Stand Linseed Oil’? 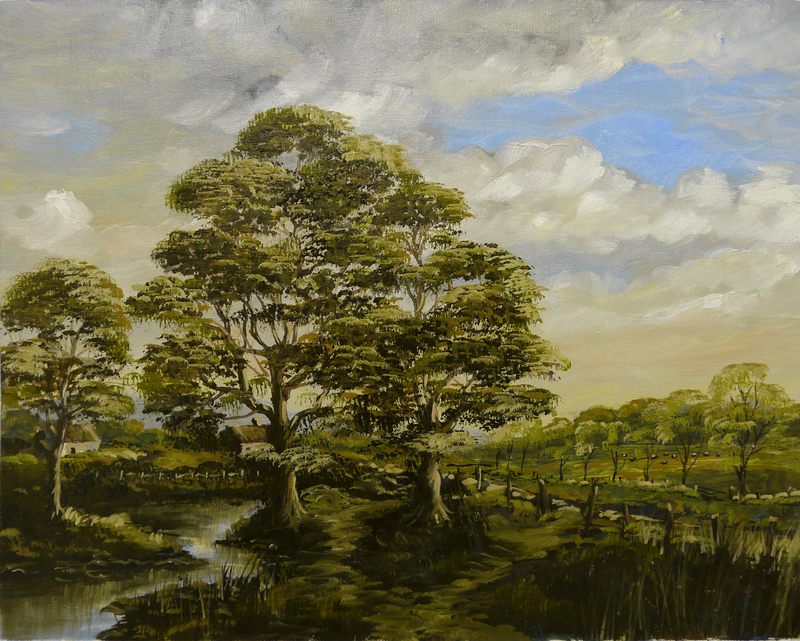 The medium used in this painting was ‘Stand Linseed Oil’. Why should one use ‘Stand Linseed Oil’ as opposed to standard Linseed Oil? For me, it was not that I wanted a thicker oily mix, but I needed to counteract the affect White Spirits has on the paint mix. This needs a little background information to explain what I mean. Recently I’ve heard artists complaining about headaches caused by the use of Turpentine. These, invariably are American artists. In Europe the use of Turpentine has been discouraged because of its toxicity for at least the last 30 years. There are several alternatives. White spirits is the most popular, but there is also ‘odourless’ solvents which are suitable for people allergic to ‘oil based’ materials. I use White Spirits to avoid the undesirable affects of the Turpentine fumes. 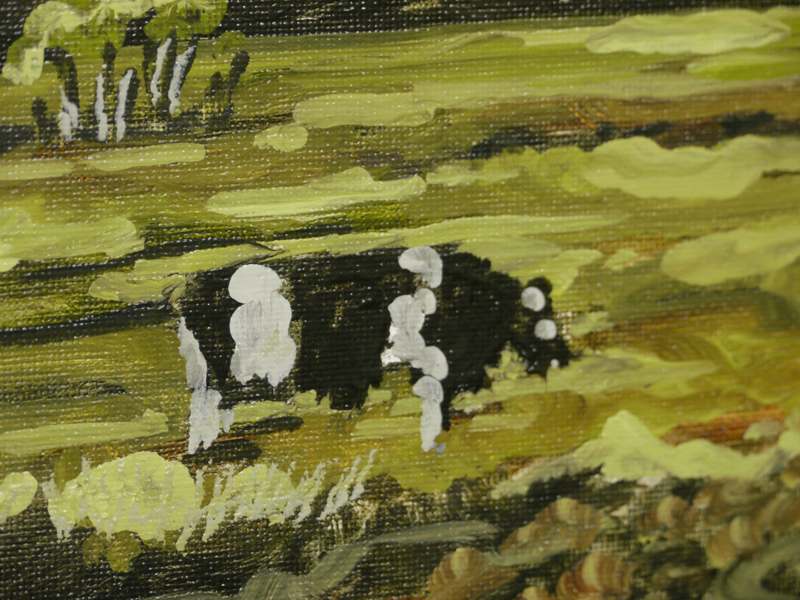 The ‘bulk’ of oil paint is part of its attraction unlike the thin staining quality of a paint like watercolour. When mixed with a medium like Linseed Oil this ‘bulk’ is retained. Turpentine also retains the ‘bulk’ when used as a solvent in the mix and helps to spread the paint mix over the surface. When White Spirits is used this ‘bulk’ collapses. The oil paint tends to behave like a wash as opposed to solid paint. This is favoured by some artists who like flat washes of colour. 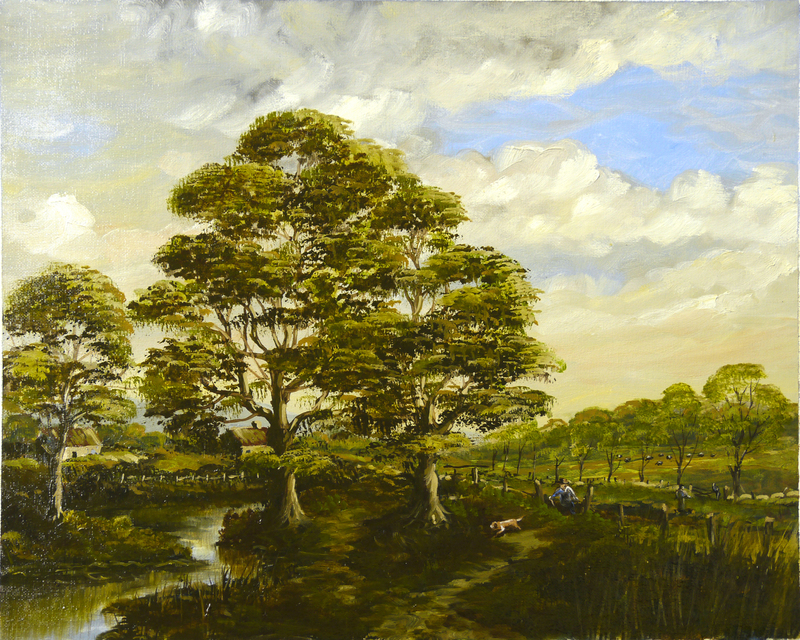 Stand Linseed Oil’s consistency reduces this ‘thinning’ of the oil paint and introduces a thixotropic quality to the mix which was needed to produce the rich heavy colours in this painting. I have the time lapse video of the above painting almost ready to publish. After ‘oiling out’ the previous work, the lost details in the shadows emerged. The painting was now a little dark and the highlights lacking sufficient ‘glow’ to justify the title. For the next stage I employed a technique called ‘glazing’. This is applying a flat layer of transparent paint over the underpainting. The mix I used was Burnt Umber and Chrome Green Light. Although the Burnt Umber is transparent the green was less so. The traditional approach is to use dark colours and allow the lighter dry underpainting to shine through. So in actual fact I was glazing and applying opaque lighter colours depending on what part of the scene I was working on. The 2 colours were not homogeneously mixed but sat side by side on the palette. Using the one large brush I picked up the Burnt Umber and added the green in varying amounts, mixing with the brush. The dark transparent colour does not have to be applied with precision on the highlights alone. The dark colour does allow the highlights shine through but any darker under-colour in the areas around the highlights are relatively unaffected. The composition is a little odd. The normal approach is to place the focus of the scene ‘off-centre’ usually one third of the width of the picture from the edge. The rest of the composition then balances the scene. This composition is on a ‘knife edge’. Its like an unobliging real scene. If the picture was cut down the centre both halves would conform to the traditional rules of balance. You can decide to go past the man and his dog to the farmers discussing their livestock on the hill or move upstream to the cottages nestling in the trees. And yet its the same scene. This world is imaginary. One bit prompted the next and so it grew. But the landscape must be credible and real enough to engage the viewer. It should have a familiarity, like a folk memory. I like creating these scenes – pure escapism. This painting turned into a sunset almost by accident. The scene is a collection of elements, like somewhere you come across while walking the dog. The details are hidden in the shadows leaving you guessing about what is in front of you. These shadows always cause problems when painting over several sessions. The darker colours dry flat and subtle differences between tones are lost. ‘Oiling out’ is the solution to the problem but the previous layers must be thoroughly dry or you will lift the paint. 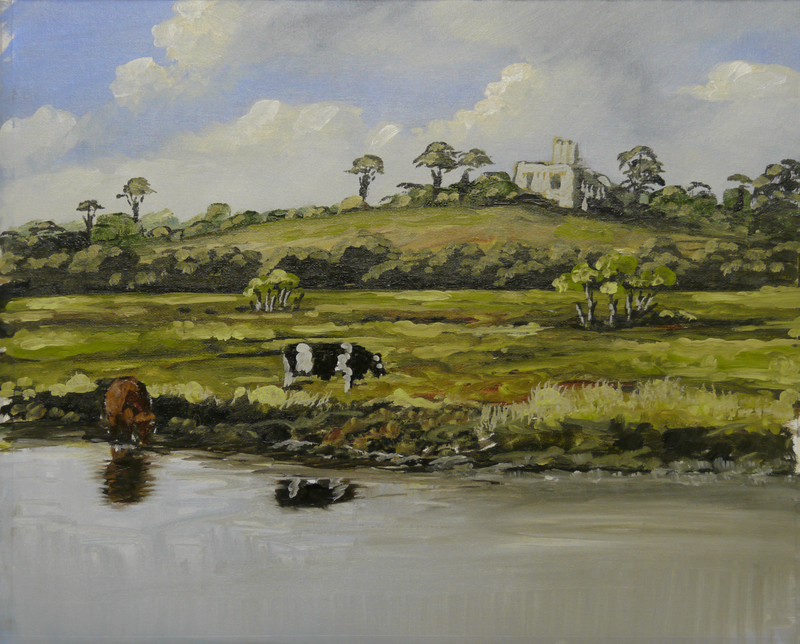 ‘Oiling out’, basically means rewetting the painting and I usually use Liquin applied lightly over the dull patches. At this stage the painting has a multitude of semi-dry patches which are featureless and I find I am tending to overpaint these already detailed areas. I will wait a few days, apply the Liquin, see what emerges from the shadows and maybe apply a few more details. This painting, to date, has taken about 3 hours. I videoed the process and will have to edit it down before I apply ‘time lapse’ to reduce it further to a ‘non boring’ 10 minutes. I am currently painting a larger than normal oil painting, 16×20 inch in fact. This means more than one painting session to complete the job. For a change I’m painting from imagination or memory of various scenes I’ve encountered recently. In other words, I am making it up as I go along. Starting with a sketch and progressing by painting in the sky and distant horizon. At this stage I leave the painting to dry for a day or two and continue to paint on top of the dry layers. In spite of reasonably warm weather the initial painting is still not dry. I used Liquin, as usual, and a small amount of Linseed Oil in the mix. So it should have dried by now – 3 days later. The problem was a ‘new tube’ of Cobalt Blue paint. When the paint is formulated and put in tubes, in order to extend the ‘shelf life’ of the tube, a drying ‘retarder’ is put in the paint. When you open the tube for the first time you will notice a clear liquid emerging ahead of the paint. This liquid which has seeped from the paint in the body of the tube, will contain a quantity of the retarder and if it gets into your paint mixture will seriously extend the drying time, as it did with mine. As I usually paint from start to finish in the one session I don’t notice this slow drying, I just put the painting aside when finished and wait for it to dry. This little omission on my part has seriously ‘retarded’ my painting progress. Couldn’t I start another painting while this one dries? Absolutely not. I find it difficult to start a new project while I’m still involved in the previous. Multi-tasking is not for me. I will mull over this in an agitated state until its done and move on to something different. Hopefully, I won’t have to wait for much longer.